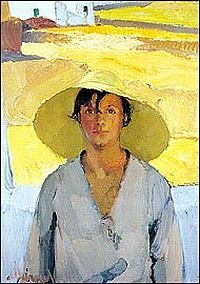 “The Straw Hat” painted 1923-1926 (86 x 66 cm). From the National Gallery collection. One of the most important advocates of modern art in Greece, Nikolaos Lytras (1883-1927) is one of only a handful of artists who radically distanced themselves from academic art and helped establish modernism for future painters. “Nikos Lytras: Building with Color and Light”, a large exhibition which opens Wednesday evening at the National Gallery running through June 2 and is curated by Aphrodite Kouria, unfolds the innovative vision of this distinctive artist through a broad selection of his portraits, landscapes and still lifes. His father, Nikiforos Lytras, was one of the most renowned painters of the late 19th century “School of Munich” generation of painters who had studied at the Academy of Munich and were trained in academic art. Nikos Lytras studied at the Academy of Munich as well but, like other artists of his generation, quickly tuned into the modern movements of the time. As the curator argues in her essay, by the time Lytras had concluded his studies in 1911, early 20th-century German expressionism, as represented by the Die Brucke group, was well under way and the Blue Rider movement was just being founded by Vassili Kandinsky. Although there is no direct link between those developments and the work of Lytras, it seems that the artist did use certain elements of expressionism, as seen for example in the broad brushstrokes of his landscapes and the use of heavy impasto, in his work, combining them with other influences ranging from post-impressionism to fauvism. The use of color in his work is also quite modern. As the curator notes, Lytras usually places cool colors in the foreground and warm colors in the background, an effect that diminishes depth and accentuates flatness, a key element of modern art. Lytras also modernized portraiture. His contemporary Yiannis Bouzianis was probably the greatest master in the genre. Throughout his short life, Lytras was assailed by the conservative critics of his time but was also recognized as an innovative artist. In 1923, he became a professor at the School of Fine Arts, being preferred to the eminent and slightly older Constantinos Parthenis, also a candidate for the post. Lytras was also a founding member, in 1917, of the Omada Technis, a group which brought together some of the most innovative artists of the time, including Parthenis, Pericles Vyzantios and Constantinos Maleas. The exhibition shows the full range of Lytras’s work and underlines his contribution to the development of modern art in this country. National Gallery, 44 Vasileos Constantinou Avenue, Ilisia, Athens, tel 210 7235937 and 210 7235937 – 8.